I chose a Pittarak because I knew I needed a tough boat. In 2004 I’d crossed Bass Strait in a 35 foot yacht. We were caught in a storm and the yacht was nearly torn apart, fore warning of the conditions the Strait can produce. I was equally concerned about paddling 90 Mile Beach. While the Strait has long exposed crossings, the landings are sheltered. On 90 Mile Beach, the same southern swells slam straight into an unforgiving coastline. Primarily, I wanted a craft that could handle massive beach landings. Next on the list was a craft that performed well into the wind and swell. Finally, I wanted something that carried well, stayed dry, was fast and fun to paddle. Let’s start with the best things…. First of all, the Pittarak is tough as nails. Below is an excerpt from the trip website which describes an occasion where the Pittarak was tested to the limit. I think if I’d have chosen another craft, my trip would have ended that day. The story begins when I pulled in for lunch in a 3 metre swell on the south coast of Victoria. The landing was onto a straight, steep beach over a shallow sandbar. My entrance was beautifully timed between sets. The exit was a different story…. “By the time I’d had lunch, the tide had dropped a bit, and in addition to the big waves breaking out the back, the medium sized ones were now crunching down in the channel. That meant that there was no hanging around in the channel to time an escape between sets, I just had to go. Having said that, the big ones out the back were mostly crumbling, with only the odd monster breaking top to bottom. I got through the shore break, got through the channel, got over what I thought was the outside break and then I saw it. The Armageddon wave I’d avoided yesterday had found me. There was nowhere to go. In the hope that I could get over it I paddled for all I was worth, but that wave just had my name written on it As the nose of the kayak rose up the face in slow motion, I watched the lip curl over and come down on me from a huge height. I was picked up like a toy, turned upside down, flung backwards, dragged underwater and pulled out of the kayak. Gathering my wits and possessions, I figured that the wave was such a freak that there probably wouldn’t be another breaking that far out. Luckily I was right about that, and I managed to swim the kayak out, then I hopped up on the deck and paddled it with a very waterlogged cockpit past the breakers. Safe and in the warm sunshine beyond the breakers, I was pumping out the cockpit and thinking what fun it had been when I saw two big gashes in the side of the kayak. 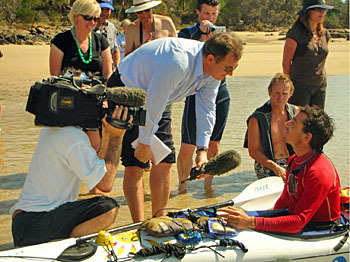 The pressure of the wave had “creased” the kayak, and on one side the glass had split completely – leaving it structurally vulnerable, and taking on water. It was then that I was very grateful for my decision to swim the kayak out rather than go back in and start again. There is almost no doubt that if I’d gone back through the channel and the shore break, the kayak would have broken up completely. 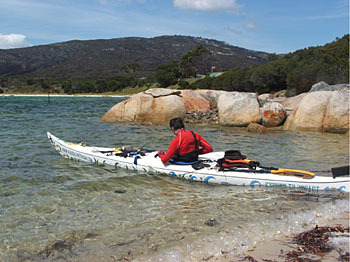 I paddled the next 20km to Cape Conran with water seeping into the kayak, stopping every 10 minutes to pump the bilge. A couple of sheets of fiberglass and some resin later, I was back on my way”. Secondly, the Pittarak is absolutely brilliant upwind. There were two days where I was punching into 30 knot winds and still managed to average 5km/hr. Other days, including a 42km crossing between Hogan and Deal Islands, was into a 20knot headwind. I think the Pittarak’s upwind performance is due to the shape of the nose – the narrow, upturned end seems to cut right through oncoming swell, and its also fantastic punching through waves when exiting a beach. I also found that with a light headwnd, (10-15knots) I could get into a rhythm with the oncoming swell, not losing speed at all. Upwind, the Pittarak is brilliant. Thirdly, it performs fantastically when loaded down to the gunnels. I’ve paddled other craft that are much faster than the Pittarak empty, but as soon as you load them up, handling deteriorates. With the Pittarak, I couldn’t believe how much stuff I could fit in it without detrimentally affecting performance. Of course it gets slower as it gets heavier, but the handing hardly changes, in fact I’d say it actually handles better when loaded. As for the drawbacks, no kayak is perfect, and some compromise in inevitable in every design. People say that the Pittarak suffers downwind, and I have to agree with that comment. If the swell is directly behind you, it pushes the back around and its hard to track straight. It’s the “pay-back” for its superb upwind performance. (Editors note; Pittarak has the option of a skeg to dramatically improve downwind handling). The other criticism of the Pittarak is its speed. Obviously, on flat water, the 5m, 26kg Pittarak isn’t as quick as a longer, lighter boat, and on the “perfect” days, I did catch myself thinking how nice it would be to have something quicker. On the other hand, I don’t think downwind performance is all that important. If the wind and swell is behind you, you’re going to get to your destination no matter what. Secondly, while the Pittarak isn’t great directly downwnd, I found that it goes extremely well at about 30 degrees to following seas. Most of the time a following swell is not directly behind you, but coming from off to one side anyway (quartering seas), in which case the Pittarak tracks beautifully. On rare days where the swell was directly behind me I found myself surfing at about 30 degrees to the swell direction (ie across the face of the wave, just like a surf-board) then catching another wave back the other direction. The rapid maneuverability of the Pittarak, and its response to “body steering” makes it possible to take this zigzag course. Its completely bewildering for people paddling alongside you, and there’s no doubt that it takes a lot more energy, but its fast, and a hell of a lot of fun. The hatch system is fantastic, especially the day hatch. The hatches seal perfectly, and it is very easy to take the covers on and off. The seat is very basic, and I think Pittarak should offer a “luxury” seat as an optional extra. The standard seat is fine for short paddles, but anything over about 4 hours and I started to get stiff. I ended up padding my seat out with layers of yoga mat and contact adhesive, but it was almost 2 months into the trip before I got it perfect, and there was lots of trail and error. I’m a big fan of the manual bilge pump as the last thing I wanted to worry about was an electric bilge pump failing when I needed it most. Finally, the Pittarak is a lot of fun to paddle. It is definitely not a beginner’s boat, and the way that you have to lean “the opposite way” to turn is completely counter-intuitive at first. However, once you learn its ways, it becomes more and more rewarding. 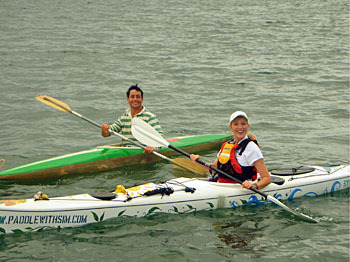 It’s a “kayakers kayak” and a joy to paddle.